You’re looking at sacred ground. I know, it looks like just a vacant field, which it is. Now. But a large white tabernacle once filled that space, and oh, the memories. For 90 years, starting in 1917, the tabernacle was the centerpiece of Rhodes Grove Camp, the United Brethren camp in Chambersburg, Pa. The tabernacle eventually became unusable, structurally unsound, beyond repair, and was torn down in 2006. But in its day, thousands and THOUSANDS of children, and adults, walked the long aisles to the front of the tabernacle, knelt at the altar, and committed their lives to Christ. Probably hundreds of them—it’s impossible to know—became pastors and missionaries. I was one of those children. It was June 1966, during Junior Camp, just after my 4th grade year. I walked probably eight rows to the front, and knelt across from a counselor, who happened to be my dad. “Do you know what you’re doing, Steve?” he asked. Dad explained a few things, and then prayed with me, his firstborn. Rev. Burton Lange was the evangelist. A few years ago, when I reminded him that he was preaching the night I was saved, he told me, quite correctly, “With your background, if it wasn’t me, it would have been someone else.” To be quite honest, I’m not sure anything Burt Lange said did the trick. I think it was just my time. I was ready. Dozens of other kids made commitments to Christ that week—just that one week. Several more camps followed that summer. Multiply by 90 years. Imagine. Forty-five minutes away is Gettysburg, a battlefield dotted with monuments to what happened there—fierce firefights, acts of heroism, turning points, valiant stands. Gettysburg is one of my favorite places. Been there many times. It’s pretty, but nothing particularly unusual—regular rolling countryside. But something epic occurred there. Kids still find Christ at Rhodes Grove, of course. Salvation doesn’t require a tabernacle. When God speaks, when He reaches out and touches your heart, you remember it, whether you’re in a historic tabernacle or sitting in a car. Hallowed grounds are being created elsewhere at Rhodes Grove, and those places will one day deserve monuments of their own. But my heart is in that vacant field. I’m at Rhodes Grove now, attending a Pastors Summit. My room overlooks that field. And I am remembering. The Global Ministries Prayer Guide is a couple years old now. This monthly e-letter goes by email to about 160 subscribers. It’s just a single page with a simple concept–two prayer needs involving Global Ministries staff, two prayer needs involving the United Brethren international fields, and two prayer needs involving the world at large. The April edition went out yesterday, April 23. 23 Apr Easter at Our Church: Dansville, Mich.
We had a full day on Saturday morning and afternoon on April 19 with about 240 kids gathering Easter eggs on the Heritage church grounds and then going inside the youth center for entertainment by a magician and munching on a bag of popcorn. By 3:30 p.m., we were more than ready to head home. Then we were back Easter Sunday morning at 10 a.m. for breakfast, sitting family style while Pastor Cal Hodgson brought a stirring sermon on the reason for Easter. We are a small, growing church in a very small community and thought we had set up enough tables and chairs for the expected service, but several more tables had to be set up in order to have room for all those who had come to worship with us. What a wonderful problem that was for us. All in all, a wonderful and meaningful Easter Sunday! 23 Apr Easter at Our Church: Goshen, Ind. We have the great opportunity in our church to have two congregations but one church. Let me explain: We have an English-only speaking congregation and a Spanish-speaking congregation (some of us are bilingual), but yet we are ONE. Although we normally have separate times for our services, it’s always a pleasure when we can get together. And that we did! We got together for Resurrection Sunrise Service at 7 am, praising our risen Savior in song and adoration! What a blessing to be able to praise the Lord in different languages! Phil Whipple (right) presents the winner’s plaque to Paul Hirschy. 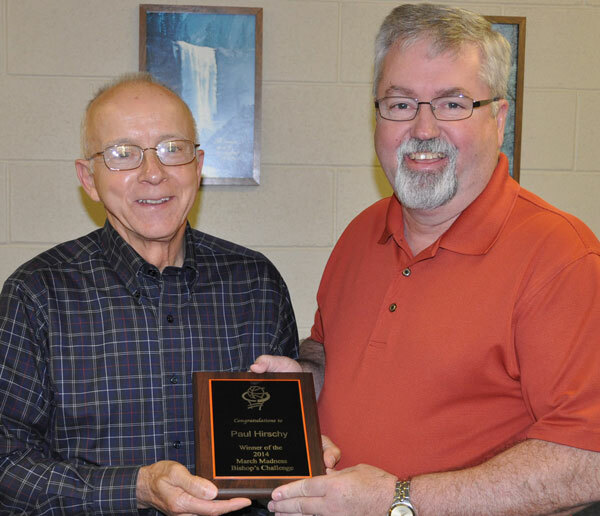 Bishop Phil Whipple presented a plaque to Paul Hirschy for winning the Bishop’s March Madness Challenge. Of the 68 persons who filled out NCAA brackets in the bishop’s group on ESPN, Hirschy emerged as the winner. Gary Gates (right) will undergo at least a three-bypass heart surgery on Wednesday morning, April 23. Please keep Gary and his wife, Rebecca, in your prayers. Gary is pastor of South Scipio UB church in Harlan, Ind., and also works part-time as the UB Director of Ministerial Licensing. Here’s a video to add to the previous report from Mongul UB church (Shippensburg, Pa.). On Saturday, April 19, their Easter Eggs-travaganza attracted 563 adults and children. Volunteers had filled nearly 13,000 eggs. Scott Graham, senior pastor, Good Shepherd UB church (Greenfield, Ohio). The folks at Good Shepherd, recognizing the Easter season as an opportunity to reach people when they are the most receptive, provided multiple opportunities to experience the reality of Christ’s sacrifice and resurrection. The week started with Good Shepherd hosting the community’s annual Palm Sunday service with many local churches participating. For the first time, Good Shepherd held a Maundy Thursday service that was called “Passion Night.” The event celebrated and remembered the Last Supper as well as the events surrounding Jesus’ crucifixion. The candlelight service was experiential, interactive, and very moving as participants handled a scourge and crown of thorns, and pounded a large nail into a cross. Easter Sunday was the culmination of a great Holy Week. Good Shepherd tripled its average attendance with 321, and 20 people accepted Christ! Then more than 80 children collected over 4,000 candy and prize-filled eggs in the three Easter Egg hunts! Every child received at least one of the hundreds of large and small prizes, including bikes, scooters, electronics, sporting equipment, and an American Girl doll that were donated from folks in the congregation. 22 Apr Easter at Our Church: Lakeville, Ind. Anthony Kuhns, Olive Branch UB church (Lakeville, Ind.). Easter at Olive Branch was standing room Only. God has been blessing us with tremendous growth! The Easter season is always a great time of the year for United Brethren churches. 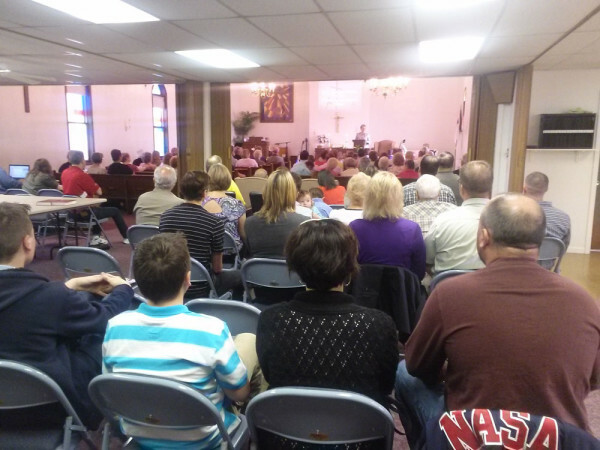 There are Lenten emphases, special services (Palm Sunday, Maundy Thursday, Good Friday, Easter), outreach events, and often record attendances. While the Easter season is still fresh in your mind, please write up a little description about any special ministries, programs, events, services, activities, etc. at your church. We’ll get it posted on UBCentral.org. Other United Brethren will enjoy hearing about it.